For many years now, continuous processes in pharmaceutical production have been the focus of the special machine builders of L.B. Bohle. With the inauguration of the Technology Centre, the engineers, scientists, pharmacists and IT developers for the first time closed the loop control circuit of a modular system along the entire process including production, sensor technology and controlling. "Series production is set to start as soon as we have received FDA clearance. There is no need to develop, install and validate a new production line," explained Dr. Hubertus Rehbaum, manager scientific operation at Bohle. Two basic ideas are at the core of the successful development project: first of all, the best machines for the individual process steps must be optimally linked to each other, both physically and technically in terms of data. "We have leveraged our acknowledged premium quality in the areas of granulation and coating and, with the companies of Gericke and Korsch, have taken on board another two technology leaders for continuous blending/dosing and tablet press technology," said the initiator Lorenz Bohle. Secondly, the machines had to be equipped with state-of-the-art sensor and measurement technology and all data had to be integrated on a common platform via standardized interfaces. The software integration, in turn, forms the basis of permanent monitoring, controlling and documentation of the continuous production process. Advanced spectroscopy technologies, such as NIR and Raman, enable precise measurement and analysis during the individual production steps," explained Rehbaum. Consequently, the leading companies in this area, Kaiser Optical Systems, Sentronic and Kraemer Elektronik, have been involved in the project. Nevertheless, a major challenge arose from directly processing this generated data and making it available for use. Together with the IT partners and university scientists, models had to be developed for simulating various processes as well as for defining and automatically initiating corresponding measures and interventions. "Together, we have developed the intelligence of the system, so to speak," said Rehbaum. This “evolution process” will continue in the future. 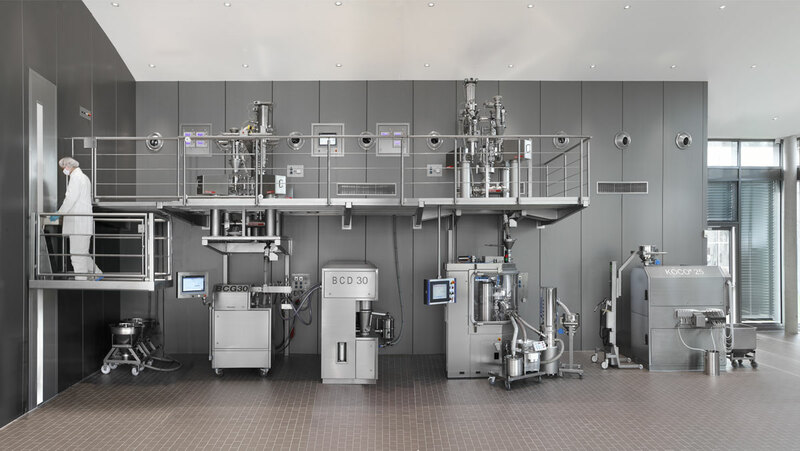 At the Technology Centre at the Bohle headquarters in Ennigerloh, customers from the pharmaceutical industry can now experience the benefits of continuous production first hand. "The unique feature of this plant is that the tablet production can be implemented either without granulation or with dry or wet granulation, in one system," explained Bohle. The modular concept of continuous production offers substantial time savings since it does not require any time-consuming analyses of the product samples between the process steps. Moreover, producers benefit from greater flexibility because the plant can be quickly converted to different products.